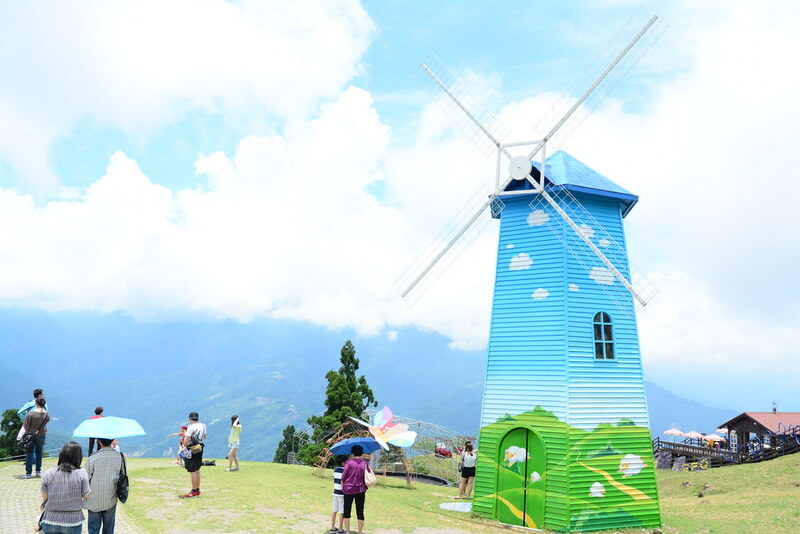 Cingjing is a group of farms located at Ren'ai Town in Nantou between Hohuanshan and Wushih. Cingjing is one of the most popular visit among both foreign and local travelers. Why Cingjing Farm is special ? Cingjing Farm is a group of farms located at Ren'ai Town in Nantou County between Hohuanshan and Wushih. It rises to a height of 1,748 meters covering an expanse of around 760 hectares. The average temperature is around 16 degree Celsius. Daily temperature difference is around 2 to 5 degrees. The high altitude occasionally forms humid fogs. Thus it was nicknamed paradise in the fog. The spacious farm covers with green pastures. Wide open green hill suitable for hiking and activities. The campsite next to a lake provides excellent camping ground for up to 1,000 campers. The alpine vegetation here consists of temperate fruits especially peaches, apples, pears and plums. Spring is the perfect time to see the flora blossoms. Summer is the time for the tasty fresh fruits. What to explore at Cingjing Farm? Passing native forests, through towering gorges, you can immerse yourself in the fresh air and the scenic wild greenery of the Qingjing Veterans Farm. Facilities in the Farm include: the Tourist Center, the Green Green Grasslands, the Small Swiss Garden, the Recreation Center for visitors, the Shoushan Park, the Guest House and a Stock Nurturing Center. The working partners of the Farm are putting in all efforts to incorporate the Farm with nearby tourism projects, making it an attraction, to provide a cozy and enjoyable nature trip for all visitors. Cingjing Farm is divided into different areas including the Cingjing Farm where the famous sheep shearing show takes place. The sheep section bred many types of sheep from black goat, black belly sheep and the dairy goat. The cattle section bred different cows from around the world. The vegetable area offers the freshest fruits and vegetables. As for the flower viewing section, the farm offers lily, tulip, calla lily, and many other sub-tropical flowers. How to get to Cingjing Farm? 1. National number 1 highway(國道一號), exit Yunlin offramp(雲林系統交流道), connect to Tai 78 route(台78線), take Gukeng intersection(古坑系統交流道) to exit at Caotun offramp(草屯交流道), drive along Tai 14 route(台14線) to reach. 1. From Taipei, take Guoguan bus(國光客運) to Puli and exit at Puli station(埔里站), transfer to Nantou bus(南投客運) heading Songgang(松崗) to reach Cingjing. 2. From Taichung or Kaohsiung, take Guoguan bus (國光客運) to Puli station(埔里站), transfer to Nantou bus(南投客運) heading Songgang(松崗) to reach Cingjing. The sheep here are very friendly; you usually have their pictures taken with them. You should put sunblock and bring a cap. Umbrellas are asked to be closed during the show to allow others to see the stage. You need to wear proper shoes, sneakers or hiking boots. Watch out for sheep droppings as you walk along as you will be interacting with the sheep as you traverse the pathways across the farm. The Sheep Shearing Show will not perform on rainy weather and every Wednesday. There are some performance only happen on Saturday & Sunday, make sure you arrange your itinerary correctly. You can buy some sheep food from one of the dispenser machines around if you wish to feed and get close to the sheep. You should note that this place is not wheelchair or stroller friendly. People with mobility problem might find this attraction challenging. The ticket to the sheep farm also entitles you to the horse performance a short walk away. A farm high up in the mountain. Went in end September 2015, weather is coolly. Be sure to be there early. Bus loads of tourist start flocking in after 11am. I was there at around 10am, that was when there was slightly lesser people. Views was magnificant. Sheeps roam freely by the mountain side. Feels like a mini Switzerland. Once you bought a ticket and go through the gantry, green patches of grass with sheeps awaits you. They aren't shy, feel free to sayang or pet them. I was there on a weekday and there was no show on a weekday. During weekends, there is public show time when the sheeps perfom and shaving of sheeps fur. Ideal place for wedding shots. Windmills is also there. Take more photos of the greenery in there. There isn't much food options in there but there is a small hawker outside the exit.